Here’s a test of your local history knowledge: where is Emerald Hill? What about Sandhurst, Sandridge, Hotham or Phillipstown? If you’re not sure, don’t worry! Gazetteers and atlases are rich with examples of Victorian place names that have fallen out of use. These names are all historic monikers for well known places. Emerald Hill is now known as South Melbourne. Port Melbourne was known as Sandridge, and Hotham was the name for North Melbourne. Phillipstown was an early name for part of Brunswick. And Sandhurst was the name for Bendigo. 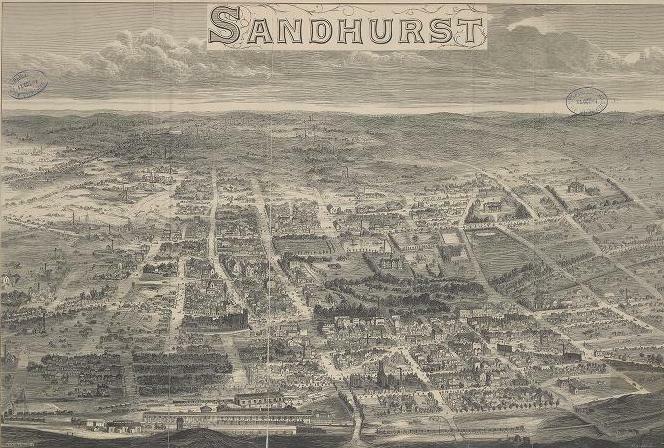 If you search for pictures of Sandhurst on our catalogue, you will find over 500 images to view online. If you are researching the history of any historic place it’s worth searching for its original name in our catalogue to see what you find. Even today, there are obscure suburbs waiting to test your geography skills. The miniature suburb of Travancore squeezes itself between the Tullamarine Freeway and Mount Alexander Road, near Flemington. Its claim to fame is the premium prices asked for the houses on its leafy, secluded streets! A book called Old Hartwell: the life and times of the village that lost its name has recently arrived on our shelves. In it author Volkhard Wehner says that ‘it would not be at all surprising to be asked, even by long term residents of Melbourne, where one might find Hartwell’ (p1). Hartwell is located between Camberwell and Warrigal Road. Despite its obscurity, Wehner has managed to amass 367 richly detailed pages outlining the political, cultural and social life of the area, enhanced by the inclusion of many maps and images. To locate ‘missing’ country towns, you can check the book Lost & almost forgotten towns of colonial Victoria: a comprehensive analysis of census results for Victoria, 1841-1901. One of the towns it includes is Happy Valley, a mining township which was the location of the gloriously-named Lucky Woman’s State School No. 267, which operated between 1860 to 1882. The book gives GPS coordinates to help you track down locations. Some name changes will be more obscure and difficult to research, but there are other resources which can help. For example, the book Victorian place names and registration districts (for use with Victorian birth, death and marriage indexes), includes a list of places now known by another name. It tells us that Torquay was once known as Puebla, before being renamed after the Devonshire seaside resort of Torquay. Names of Victorian railway stations (published 1918, available online) tells you what train line an old town or suburb was on, helping you to narrow your search region. It also gives you details of where names originated, and sometimes includes a brief history of a town’s development. The government’s Vicnames website can be searched to find the GPS coordinates of some historic towns, pastoral stations and landmarks. Finally, the Library’s own Local History Index includes many short histories of place names, both common and obscure. It can be accessed on microfiche in the La Trobe Reading Room reference area, which is on Level 3 of the Library. This area is open from 10am-6pm daily.